The root of ginger is used in cooking, but due to their healing qualities, high content of vitamins and minerals used in medicine. It has a tart flavor and pungent taste, due to the content of essential oil and penelopides substance gingerol. Used in the preparation better fresh grated or chopped root of ginger - it has the aroma and the active substances more than dried. 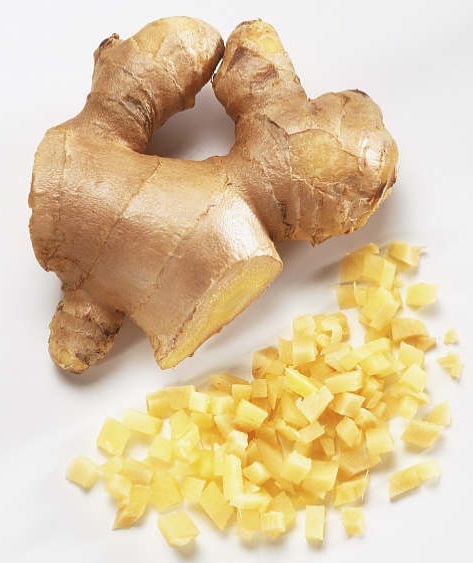 Root ginger adds subtle flavor and aroma of fish and meat soups and broths. When added to hot meat dishes ginger not only enhances their taste and adds flavor, but makes the meat softer. He put in almost all meat dishes from beef, pork, lamb, Turkey, chicken and goose. In South-East Asia with him, we prepare all dishes from rice and vegetables. Ginger can be used in the preparation of confectionery: biscuits, cakes, puddings, jams. It is added in fruit compotes and tea. Fresh root ginger should be firm, malevolently, without black spots and mold. Before use, cut the desired piece with a sharp knife and clean it from the skin. Store it in the refrigerator in a paper bag, storage period is 1 month. The largest amount of nutrients of ginger is under the skin, so the young root is better not to clean at all, and the more Mature brush, cutting off a very thin layer. The peeled root can be stored for long Bay with vodka or sherry. Depending on the recipe of what dishes include root ginger, time of cooking will be different. If you add it to the dough, then grate the root on a fine grater and add the flour to the time the mixture of ingredients. In that case, if you simmer the meat with the ginger, then cut it in small pieces and put in pan with meat for 20 minutes until tender. In puddings, fruit drinks and teas ginger add 5 minutes before end of cooking. Sauces ginger is used raw, grated on a fine grater. From grated on a fine grater ginger root to make ginger juice well vegetables using a cheesecloth. The juice can be used in the composition of dressings for salads and sweet dishes, mixed with soy sauce, honey, olive oil and lemon juice. If you bought a ginger root in powder, before use it is necessary to soak. Note that in dry form it although less flavorful, but spicier than fresh, so add it in smaller amounts.